First things first: frozen berries do not need to be thawed when used in baked goods. 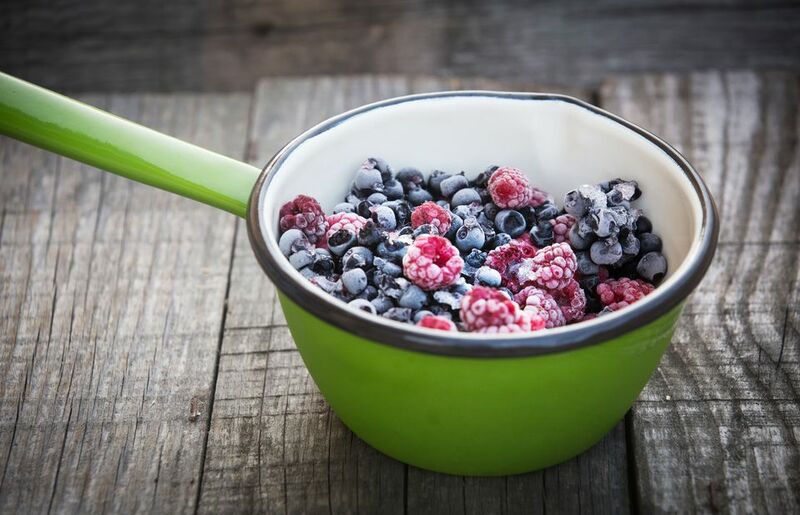 If you're making muffins or a cobbler or a pie, just toss the frozen berries into the batter or bowl the same way you would with fresh berries and continue with your recipe. If, however, you want to try and thaw berries so that they can be used in dishes as fresh berries would be -- as garnishes, or in salads -- you can thaw them using this method to best retain their shape and appearance. It won't be quite the same as using fresh berries, but it will certainly come close. Place the berries (about 1 cup maximum at a time) in a single layer with plenty of space between the berries on a paper towel-lined microwave-safe plate. Put them in a microwave on "defrost" for 30 seconds. Check the berries and repeat until the berries are defrosted (about 30 seconds for raspberries and blueberries, 1 minute for blackberries, and up to 2 minutes for strawberries). Immediately remove berries from the microwave to stop any cooking. The berries should look lightly frosted and have retained their distinctive shape. Carefully lift the berries off the paper towel and place them as a garnish or in a salad or however you were planning on using the frozen berries as fresh. It's important to note that thawed frozen berries will be more delicate than actual fresh berries, so they will start to fall apart quite quickly if tossed in a fruit salad, for example. Treat them accordingly if you want them to keep their shape. Again, the times when you need to defrost berries before using them are limited. Any time berries are being baked or cooked -- including being turned into a sauce or jam -- they don't need to be defrosted first. The baking or cooking process will take care of that for you. There are even cases where frozen berries are preferable: most particularly, when making smoothies, where using frozen berries will thicken it up into a delicious shake (Frozen fruit is the secret thickening ingredient for those who prefer to make smoothies without bananas). A final note on frozen berries: when quickly frozen in prime condition, frozen berries behave just as deliciously in recipes as fresh berries. Extensive side-by-side testing of baked goods and smoothies supports this claim. So when the market is full of perfectly ripe, lush berries, be sure to buy some extra and freeze them -- you'll thank yourself in the off-season.